The very early days of East Kimberley Tours. East Kimberley tours was started by Bob and Norma Wainwright and their son Paul in 1983. Paul and Bob were two of the first people to conduct tours into the Bungle Bungle over 30 years ago. They went for ‘a bit of a look’ after seeing a television program provided to them on VHS. It was a video that was to change Paul’s life. After that ‘look’ in 1983, Paul applied for a Safari Licence through the Department of Transport, and Turkey Creek Bush Safaris was born – touring the Bungle Bungle in an 8 seat Toyota Arkana vehicle. 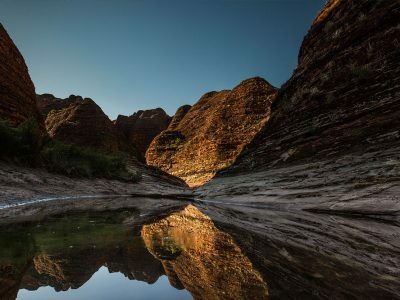 In 1986, Paul and his family re-located to Kununurra and it was felt that the profile of the business should change and Turkey Creek Bush Safaris became East Kimberley Tours. The acronym EKT is synonymous with the Wainwright family as Paul’s father Bob operated East Kimberley Transport (EKT) for many years throughout the Kimberley region. In 1986, East Kimberley Tours purchased their first new vehicle and in 1987, the Bungle Bungle was declared Purnululu National Park by the Department of Parks and Wildlife (DPaW). 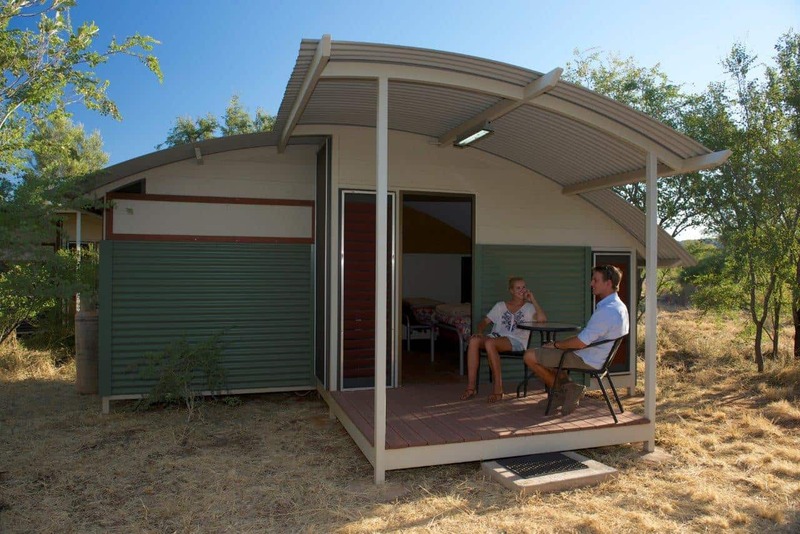 Tours were operated from Kununurra and were 1 or 2 night options (return to Kununurra) and after becoming a National Park, two campsite areas were set up within the Park by the DPaW – Walardi and Kurrajong. EKT had a seasonally permanent camp at the DPaW Kurrajong Camp which consisted of a caravan-type unit with a big water tank, kitchen area and 3 showers and toilets (however, the showers and toilets were not used due to the requirements for waste removal). Long drop toilets were set up and bush showers. EKT provided all of the camping equipment (tents, bedding etc) for its guests. In 1992, a Fly/Drive Licence was obtained which enabled EKT to provide fly-in, fly-out options for day tours and overnight stays to the Bungle Bungle, working collaboratively with local aviation companies such as Slingair Heliwork WA (now Aviair and HeliSpirit) and Alligator Airways ( no longer operating). It was also 1992 when East Kimberley Tours set up their own camping area within the Bungle Bungle at the Bellburn location. Remembering this day as if it were yesterday, Paul and his team had guests staying at Kurrajong Camp for one night and then, during the next day – peak season in July – the moved all of their camping items to the Bellburn area and set it all up in time for the guests to stay in the new location the second night! What a day that was! In 1994, the first of EKTs permanent safari tents were installed to assist with coach groups such as APT, Scenic and AAT Kings. EKT would meet the guests off these coaches at the Bungle Bungle turn-off and drive them in to stay at their camp. Prior to setting up these permanent safari tents, EKT used to collect not only the passengers but all of the coach companies camping gear, food, equipment and the hostess, take them all into the Park, set-up all of the tents etc, tour them around and then, the next day pack-down and return the guests to the coach! Obtaining another licence through Department of Parks and Wildlife (DPaW), EKT set up 25 permanent twin-share safari tents and through this licence, they were able to have three long-drop toilets (for up to 60 guests!). Paul also constructed two 6 bay shower blocks. A camp kitchen and enclosed dining area were also constructed at this time. In 1997, the camp kitchen and dining area were upgraded and this area is continuously upgraded to meet with customer demand. East Kimberley Tours were tour operators but the accommodation side of business was growing. 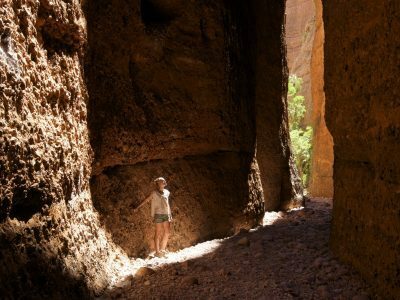 East Kimberley Tours set a precedent for having private operators in National Parks and it is a credit to the Western Australian Government that they have worked with operators and allowed this to happen. Since 2003, East Kimberley Tours have been operating as they still are today – with fly/drive and accommodated tours to the Bungle Bungle. Gradually over this time, the fleet of eleven vehicles (that used to traverse the Gibb River Road and up to the Mitchell Plateau as well!) reduced to three. In 2004 EKT received an accommodation licence (separate to the tour licence) – and ….. the EKT Bungle Bungle Bushcamp was born. The year 2005 rolled around and EKT still had their safari tents but put in new ablutions blocks with eco-friendly low-flush toilets, solar hot water/spring loaded taps. Seven buildings were constructed providing 14 new showers and toilets – much better than three long-drop toilets! Growing the business with increasing consumer demand, 2010 saw Paul commence construction of 16 hard-walled twin share, ensuite cabins. 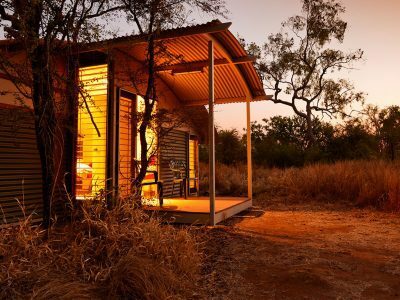 These were designed to fit within the landscape of the Purnululu National Park and provided guests with more privacy, timber decking at the entrance and their own outdoor furniture. A further four cabins have been constructed since then which have been attached to the existing ablutions. The dining room has also been completely upgraded and there is a large outdoor dining area on timber decking. In 2015, EKT added their pool and finished constructing the cabins – providing guests with 27 cabins to choose from at the Bushcamp. So from a VHS showing the magnificence of the Purnululu National Park back in the early 80s, a multi-award winning business has stood the test of time and still thrives today.